With spring on our doorstep, it’s a perfect time to visit the Cornwall area and experience all that there is to offer. There’s no shortage of festivals and events to keep you busy in April. From popular races and a national sports championship to Cornwall’s very own pop culture event and world-class entertainment on stage, there are plenty of reasons to plan a road trip or weekend getaway. Get your cape on at the annual Cornwall & Area Pop Event, taking place April 27-28 at the Benson Centre! This annual celebration of pop culture features celebrity guests, artists, cosplayers, exhibitors, panels and much more. CAPE 2019 will feature special guests including a Degrassi High Reunion! Featured guests include Pat Mastroianni (Joey Jeremiah), Stacie Mistysyn (Caitlyn Ryan) and Stefan Brogren (Archie “Snake” Simpson). Guest artists, cosplayers, exhibitors and other attractions will also be featured. Experience one of eastern Ontario’s oldest and longest canoe races on Sunday, April 14th with the famed Raisin River Canoe Race. Individuals from all over the region come together to participate or watch the event, which stretches from St. Andrew’s to Williamstown. Participate in the race as a team or go solo for this fun, action-packed event! 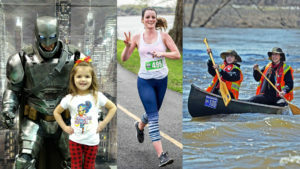 Athletes from across the region will arrive on Saturday, April 27th for the St. Lawrence Marathon – eastern Ontario’s most scenic 5km, 10km, half-marathon and Boston-qualifier marathon! Find a spot along the Waterfront Trail and cheer on the athletes participating in this popular yearly event! Or better yet, lace up the shoes and take part in one of the races! Everyone is welcome at Quilts on the Seaway presented by The Cornwall Quilters Guild. Visit St. John’s Presbyterian Church and explore the beauty of quilts, browse amongst merchant stalls and enjoy a cup of tea at this event for all ages! The event takes place on Friday, April 26 from 10 am to 6 pm and Saturday, April 27 from 10 am to 4 pm. Say goodbye to winter and step into spring by visiting the Cornwall Chamber of Commerce Spring Home & Leisure Show for the latest on home improvement and outdoor products! Learn ways to improve and enhance your home by visiting the largest consumer show in eastern Ontario. The Spring Home & Leisure Show will take place on April 5, 6 and 7 at the Cornwall Civic Complex. Enjoy modern and traditional takes on Celtic music with the Welsh and Scottish airs, Ensemble La Cigale as they perform classic and contemporary Celtic tunes on period instruments as part of the Cornwall Concert Series. The concert will be held at the Aultsville Theatre at 8 pm on April 6th. The Canadian Broomball National Championships are taking place in Cornwall this year! Watch action packed games of broomball as well as the final medal round at the Benson Centre from April 10th to 14th. Welcome the new season with a trip back in time! Groups of 15 or more can visit Upper Canada Village from April 15-28 as part of the Spring Village Walking Tours. Enjoy the beauty and serenity of the village as a guide leads an informative tour along the village’s storied streets. Prepare yourself for a night of belly-busting jokes as the Comedy Records Showcase rolls into town. An all-star lineup of stand-up comics including Barry Taylor, Dena Jackson and Nick Reynoldson will have you entertained all night! Experience the one-night-only event on April 17th and 8 pm at the NAV Centre. Attend a vinyl-filled event in support of local charities! Browse crates of classic and modern vinyl’s as Bud’s Records and Kool Things hosts Cornwall Record Bang! Enjoy beverages, BBQ hotdogs and great music on Saturday, April 20th from 10 am to 4 pm. Admission is “pay what you can” with all proceeds going towards Whiteknucklerz Riding Club who collect money for local sick children. Brace yourself as Seaway Valley Wrestling returns with High Impact at the NAV Centre! Fan favorites, returning champions and local celebrity wrestlers get in the ring to defend their titles in this action-packed night of wrestling! Participants include “The Machine” Brian Cage, “Born & Bred for Combat” Stu Grayson and “The King of the North” Carter Mason. Enjoy classical organ music in a divine setting with Nativité Recitals. The performance will be held on Sunday, April 14 at 2:30 pm at Nativité Co-Cathedral (220 Montreal Road) featuring the talented Laura Akmene. Laura was born in Latvia and studied in Latvia, Bulgaria and Spain. She received a master’s degree in organ performance at McGill. Admission is free with a suggested donation of $10. Described by Billboard as a “heartstopping tour de force,” Preston Reed is considered one of the most influential and innovative guitarists of the past three decades. This talented artist will grace the St. Lawrence Acoustic Stage at on Saturday, April 13th at 7 pm! Don’t miss this amazing intimate performance!